Ignite Michiana is a high-energy evening of five minute presentations by people who have an idea – and the guts – to get onstage and share it with fellow creative folks. Each presentation is composed of 20 slides that automatically advance every 15 seconds. Presentations can range from how to build a solar lamp to a personal passion for creating outdoor adventures to innovative solutions to local brown fields. Official list of presenters for first event March 28th! Scott Palmer – Food Fight: Why it’s time to escalate the fight for urban agriculture. Ticket are now available! You can order your tickets on line at eventbrite. HERE, NOW! 5 minutes, 18 presenters, 20 slides and one heck of an after party! It’s an evening that will inspire and educate as we feature some of the most exciting initiatives in sustainability in our area. We’ve had tremendous interest in the event and only 18 spots for presenters. If your talk is not selected, don’t despair! We are planning another Ignite event this fall, most likely with an open theme to accommodate a diverse array of great ideas. Thank you for being part of the positive change in our community! Anyone interested in being involved in Ignite Michiana is welcome to attend the first planning meeting. Committees will be formed! We will meet in the SB Brew Werks and do a brief tour of the State Theater to envision how the event will come together. South Bend Green Drinks, and talk about Ignite Michiana! Tonight! Get out of the cold and into tropical paradise! And come see Willow speak and share info about Ignite Michiana! If you’ve been wanting to check out Green Drinks (or renovations to the Conservatories), tonight is the night! No entrance fee to the Conservatories, BYOB, live music, and fabulous company! Need I say more? Didn’t think so. See you there! More information here on facebook. Ignite Michiana will take place on Thursday, March 28, 2013 at The State Theater in downtown South Bend, Indiana. The event starts at 6:30pm and consists of 16 five-minute presentations highlighting innovation and sustainability in the Michiana region. Talks can be related to business initiatives, community projects or personal passions. Ignite Michiana is an information exchange, fostering and inspiring Michiana and global communities to share, experience, and enjoy different topics from the creative and subjective, to cerebral, inspirational, technical, and philosophical. Presentations will educate, exhilarate, motivate, and move you, and you’ll look at your world in a whole new light. 20 slides and 5 minutes is all you get. Not a second more. The presenters need to get to the point quickly, and make it exciting and engaging. We welcome topics about anything that other people will find interesting. That’s a wide criteria and that’s just fine. If you’re not interested in the current topic, all you have to do is wait for 5 minutes and a new one starts. 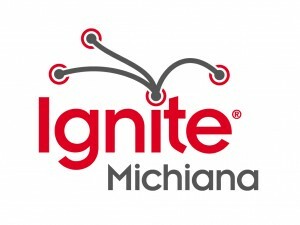 Ignite Michiana will open for submissions in January 2013. All you need to do is fill in the submission form with a short bio of who you are and the crux of what your presentation would be about. The Ignite Michiana community wants to see and hear you and your talk, so share with us what really gets you excited, passionate, or fired up. Once we close submissions on February 1, 2013, our team of judges, picked from our own community, select 16 presentations from the pool of submissions we’ve received. We work very hard to create a well rounded event night with a variety of exciting and compelling presentations. If you are selected you’ll be contacted and the real work begins. You must develop the presentation materials, and submit your final slides to the Ignite Michiana presentation team by the deadlines assigned. Then you’re onward to the stage and your 5 minutes of fame.